WASHINGTON, D.C. -- U.S. workers' reports of hiring activity at their place of employment in September held steady for the fifth month in a row. Gallup's U.S. Job Creation Index registered +33, matching the post-recession high first reached in May. The Job Creation Index has been on a steady march upward since bottoming out at -5 in April 2009, in the midst of the Great Recession. The index has stayed relatively stable for the last two years, climbing to +30 in September 2014 and remaining between +27 and +33 ever since. The average index score for 2016 so far (+32) is slightly higher than the average recorded by this point in 2015 (+31). 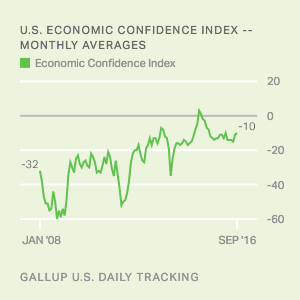 Gallup's Job Creation Index is based on employed U.S. adults' perceptions of their company's hiring and firing practices. Gallup asks a random sample of employed adults each day whether their employer is hiring new people and expanding the size of its workforce, not changing the size of its workforce, or letting people go and reducing the size of its workforce. The resulting index -- computed by subtracting the percentage of employers letting workers go (11%) from the percentage hiring (44%) -- is a nearly real-time indicator of the nation's employment picture across all industry and business sectors. In September, all regions of the U.S. had a Job Creation Index score of +30 or above. The Midwest led with a score of +35, virtually equivalent to the region's score over the last two months. The West and South had index scores of +34 and +33, respectively, while the East had a slightly lower score of +30. Reports of net hiring in the West reached a regional eight-year high of +36 in July. This strong result mirrors robust job creation numbers in California, the nation's most populous state. In August, California employers created an estimated 63,100 jobs, representing 42% of the nation's job growth that month. The state had added 36,400 new positions in July as well. No region has surpassed a Job Creation Index score of +37, recorded in the Midwest in June, since Gallup began tracking this measure. All regions are performing better on the index than they were prior to January 2008, before the depths of the Great Recession. 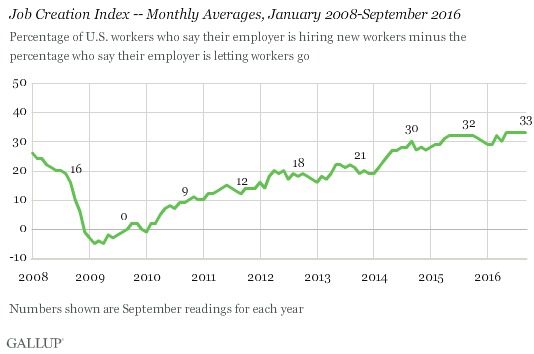 U.S. employees' reports of hiring where they work remain at the highest level Gallup has found in eight years of measurement, a distinction the index has maintained for the last five months. Relatedly, the Gallup Good Jobs rate remains strong from a historical perspective. The West, powered by an economic revival in California, continues to perform well, along with the Midwest. In this presidential campaign year, with both candidates concerned about slow job growth, U.S. workers maintain that net new hiring is solid. Results for this Gallup poll are based on telephone interviews conducted Sept. 1-30, 2016, on the Gallup Daily tracking survey, with a random sample of 17,448 workers, aged 18 and older, living in all 50 U.S. states and the District of Columbia. For results based on the total sample of workers, the margin of sampling error is ±1 percentage point at the 95% confidence level. All reported margins of sampling error include computed design effects for weighting. 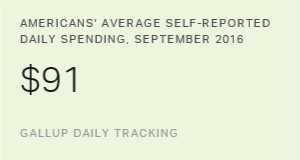 Americans' daily self-reports of spending averaged $91 in September, the highest for the month since 2008. The average was unchanged from August, the first time in seven years monthly spending did not fall at least slightly in September.